1. SOLID navy blue, light blue, royal blue, white, black, or yellow plain polo or oxford shirt with collar and sleeves may be worn. Aqua, turquoise and teal shirts are not permitted. Shirts may be monogrammed with our school logo. All other logos should be avoided. Shirts must be tucked in. 2. Navy, black, or khaki walking shorts or pants (NO JEANS) may be worn. Belts are not required for Kindergarten students. Belts must be worn with shorts/pants if they have belt loops Shorts must be fingertip length or longer. 3. Closed heel and toe shoes are required. Athletic shoes are encouraged. Matched pair of socks must be worn. Not permitted: sandals, beach shoes, boots, shoes with cleats or spikes, “roller skate” type shoe, and knee high sneakers. 1. SOLID navy blue, light blue, royal blue, white, black, or yellow polo or oxford style shirt or blouse with collar and sleeves may be worn. Aqua, turquoise and teal shirts are not permitted. Shirts may be monogrammed with our school logo. All other logos should be avoided. Shirts and blouses must be tucked in. 2. 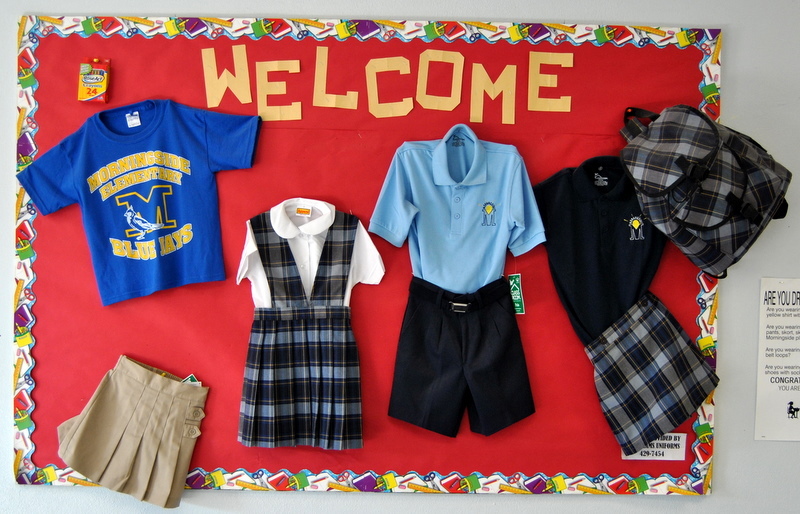 Navy, black, or khaki walking shorts, pants, Capri pants, skirt, skort or jumper (NO JEANS) may be worn. 3. Morningside plaid jumper, skirt, or skort may also be worn. Logos and designs on shorts, skirts, skorts, Capri pants, and jumpers should be avoided. Shorts, skirts, skorts, jumpers must be fingertip length or longer. 4. Belts must be worn with shorts, pants, skirts, jumpers, Capri pants, and skorts if they have belt loops. Belts are not required for Kindergarten students. 5. Closed heel and toe shoes are required. Athletic shoes are encouraged. Matched pair of socks must be worn. Not permitted: sandals, beach shoes, crocs, boots, shoes with cleats or spikes, or “roller skate” type shoe, and knee high sneakers. Morningside Elementary School T- shirts and jeans may be worn every Friday. 1. All clothing is to be of reasonable length. 2. No over shirts, oversized pants or oversized shorts are permitted. 3. No leggings should be worn. 4. 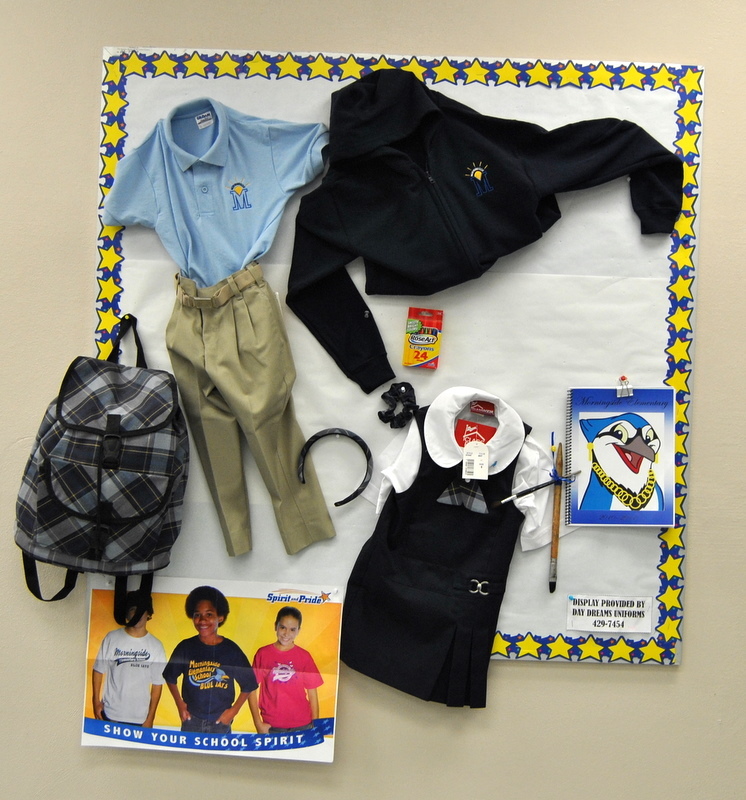 Only plain navy blue, light blue, royal blue, white, black, or yellow sweaters, sweatshirts or jackets are allowed to be worn in the classroom (no designs on these items).May have MSE logo, no other logos. 5. Students may wear a jacket of choice on cold days, but should they wish to keep a jacket/sweater on in class, it must be in accordance with #4 above. In addition all students are expected to have a natural hair color (i.e. not artificially colored hair in pastel shades, fluorescent colors, etc. ), as well as a hairstyle that is not a distraction to the learning environment. (Ex.No, mohawks, fauxhawks, or designs). Body piercing should be limited to the ears.